Even after a decade of living here, I still have the worst sense of direction. Never mind that Manhattan is on a grid -- I still get totally lost every time I emerge from an unfamiliar subway stop. I do try my best: When I come out from underground, I try to use logic to orient myself. I consider the direction of the train, which ways and how many times I turned on my way up the stairs, whether I need to head East or South from the subway stop... But try as I might, I'm always wrong. So much so, that I've devised a funny system: If I am convinced I should go left when I exit the subway, it is most certain that I actually need to turn right. Laugh, but I'm not exaggerating at all -- this system actually works about 99% of the time. When I first moved here I didn't have a smartphone, so I spent time studying the subway map in advance of leaving home, and I carried a compass with me to orient myself on my way out of the subway. It may have made me look like a tourist, but it was much better than getting lost. Now, however, I use several apps to get me to where I need to go. The best things about all of these maps is that they're free, they require no advance planning, and if they work well enough to orient me and my lack of direction, they will work for anyone: Tourist or not! 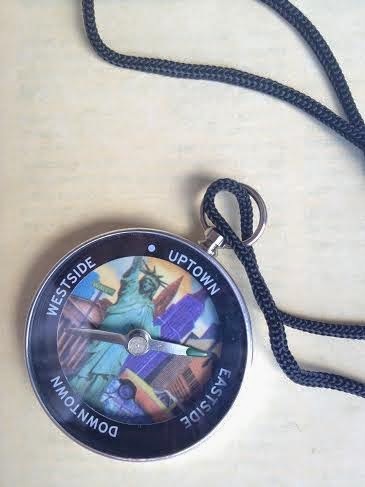 Google Maps or HopStop are obvious choices, and they often act as my new version of a compass when I exit a subway. To be fair, sometimes I do end up walking a half a block in the wrong direction before Google maps catches it and corrects me, but I'm willing to take that chance so that I don't have to carry a compass. 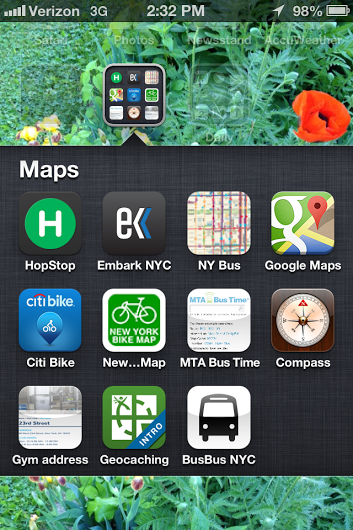 I use the New York City Bike Map app when I take a CitiBike, and I also wrote about how I regularly use these apps for catching buses. But out of all the options, the app I really use the most often is Embark NYC. What I like about this app is that it can be used without an internet connection, so while underground one can still access it and check where she's headed. If an unfamiliar subway stop or a train delay sends one off her regular route, finding a new route is simple. It's so much better than finding a physical subway map posted in the subway, because it's quick enough to use between stops, and certainly won't have graffiti covering the exact area needed. Even better, one doesn't have to study a subway map in advance, and, if that someone is me with my terrible sense of direction, I can discreetly open the app, which means I finally can stop looking like a tourist after a whole decade of living here.